Apple crashes 40%. Time to bite? This is one of the world’s most famous quotes about stock investing by legendary investor – and Apple shareholder – Warren Buffett. With Apple shares crashing 40% lower last year, investors have every right to be fearful. So, is it now time to be greedy? Let’s take a look! On 9 January 2007, Apple unveiled its revolutionary iPhone device. At the time the stock price was just $11.94 per share. On its 10-year anniversary – and 15 iPhone releases later – Apple’s share price opened at $144.73. In the following year – and three more iPhone models later – Apple surged to a record high of $233.47 on 3 October 2018. The company became the world’s first trillion-dollar publicly listed company. But then something happened almost no one predicted. Apple’s stock price ended the year almost 40% lower from its record high – wiping out $446 billion in shareholder value in the final months of 2018. And, so far this year, it hasn’t started any better. Shares dropped 9% in just the second trading day of the year – even Warren Buffett lost more than $3.8 billion (at least on paper). What caused the fearfulness in Apple’s share price? Analyst downgrades: Institutions such as HSBC, Bank of America Merrill Lynch and Rosenblatt Securities all downgraded Apple’s stock in the last quarter of 2018 from a ‘buy rating’ to a ‘hold’ or ‘neutral rating’. Insider selling: According to Markets Insider, insider trades have heavily leaned towards the sell side with 34 sells in the last 12 months compared to 23 buys. Slowing iPhone sales: On 2 January, Apple CEO Tim Cook warned that – for the first time in a decade – revenue would miss estimates by the tune of around $7 billion. Why? Because of slowing iPhone sales, which account for a whopping two-thirds of their overall sales. No longer reporting unit sales figures: Many investors and investment banks have criticised Apple’s decision to stop reporting iPhone unit sales. For most people it has been used as a key metric to gauge demand for the company’s latest products. This has fueled fears the company is trying to hide softer sales in the future. Trade war pressures: In a letter to investors, Tim Cook, blamed an economic deceleration in China for slowing iPhone sales. He added that the trade war between the US and China had exacerbated an already weakening economy over there, which – in turn – has affected overall sales in the Greater China area. While many of these reasons fuelled a sharp sell off in Apple stock, many people point to the simple fact in 2010 a brand-new iPhone cost just under $200. And now, the latest iPhone costs a whopping $1,149. It seems technology doesn’t always get cheaper over time. Twelve years ago, 120 million people owned a mobile phone. In 2019, over five billion people own a smartphone. Apple was the driving force behind this but now faces much more competition and saturation. So what’s next for the company and is it now an opportunity to buy? Let’s take a look. Source: Admiral Markets MT5 Supreme Edition, Apple, Monthly – Data range: from 1 July 2006 – 22 January 2019, performed on 22 January at 7:58 PM GMT. Please note: Past performance is not a reliable indicator of future results. 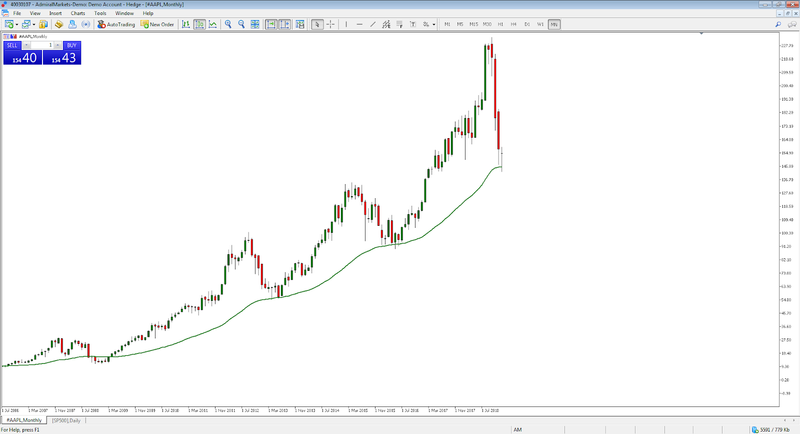 Historically, the share price has found support at the 50 exponential moving average (50EMA). Moving average indicators are useful in identifying long term trends but are also useful in identifying areas of support or resistance where the market could change direction. In this scenario, some longer term players may use this area to start initiating long positions. However, most long term investors would also like to see a positive future in the fundamentals of a company, so let’s take a look. Longer term investors may be encouraged by the growing services revenue division which Tim Cook reported would be 28% higher than last year. They may also be encouraged by the fact Netflix has recently announced they will be increasing their subscription prices by 18%. This opens the doorway for Apple to do the same thing as they compete for streaming customers. Fortunately, Apple have been showing steady growth in paid subscription numbers. While the long term picture does look compelling there are still – as in any form of investing – associated risks. However, for those interested in having an investing account to invest into longer term stock and ETF positions, from 15 of the largest stock exchanges in the world, visit Admiral.Invest. The weekly chart of Apple’s share price presents an interesting picture both technically and fundamentally. Source: Admiral Markets MT5 Supreme Edition, Apple, Weekly – Data range: from 7 August 2011 – 22 January 2019, performed on 22 January at 8:07 PM GMT. Please note: Past performance is not a reliable indicator of future results. 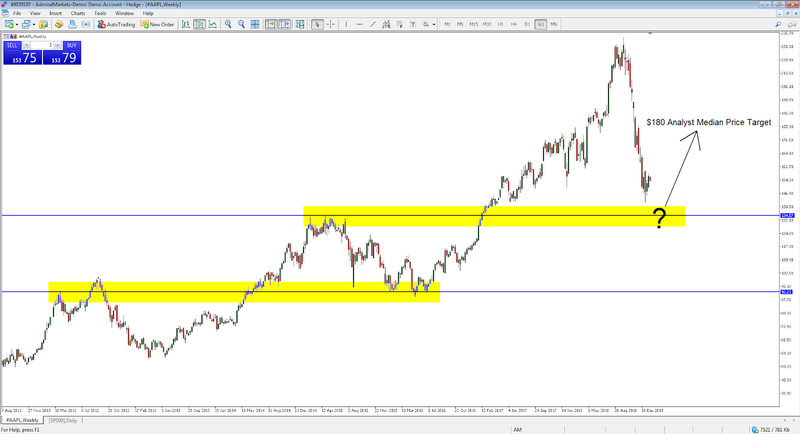 In the chart above, the yellow zones represent levels of historical resistance that – once broken to the upside – turn into support levels when price retraces. Shorter time frame traders would lean against these support levels to initiate long positions from. The next level of support for Apple stock is $134.57 highlighted by the top blue horizontal line. While some brokers have downgraded Apple from a ‘buy’ to ‘neutral’ there are others who are still bullish on the stock. 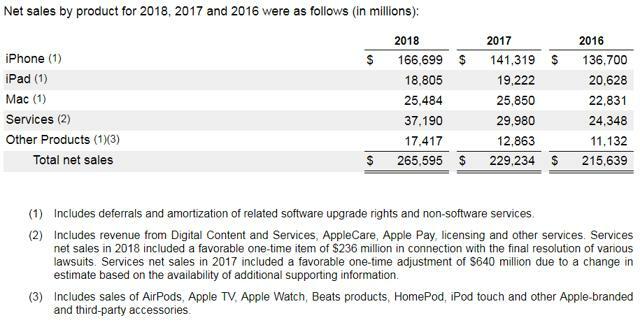 Perhaps the most interesting element of these analyst recommendations is the median price target of $180.05 for Apple’s share price. That provides plenty of uplift from current prices and can serve as a useful edge for short term traders trading on Apple stock CFDs using the Admiral Markets MetaTrader 5 platform. Trading Apple stock is arguably one of the hottest topics on Wall Street right now. And, with the company’s earnings announcement and trading update due on 29 January big moves can be expected. How will you be trading it? Source: Apple crashes 40%. Time to bite?